Police targeted under-age drinkers in a blitz on anti-social behaviour across East Dunbartonshire last weekend. Officers’ presence more than doubled in the area as part of the force’s national initiative: Campaign Against Violence. Targeted patrols seized vodka, cider, Buckfast and beer from young street drinkers and also charged a number of people with drugs offences. The campaign was led locally by East Dunbartonshire’s new area commander, Chief Inspector Craig Smith, who said his priority is to work with the community, listen to concerns and keep people safe. He told the Herald: “On Friday night I was delighted to welcome police officers from the Campaign Against Violence, which is a national initiative that supports front line policing. “This allowed me to maximise the number of police officers we had working within the communities of East Dunbartonshire, keeping people safe and focusing on the priorities that have been identified by the community. “These additional officers worked with local community policing teams and community wardens from East Dunbartonshire Council, where together they provided reassurance to the local communities and prevented any violence and disorder taking place. We also provided live updates, using social media, about some of the incidents we were dealing with, and by taking proactive measures reduced the risk of violence and disorder within our communities. 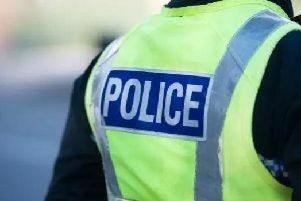 During last weekend’s blitz, a man was charged with an alleged drugs offence in Luggie Park, Kirkintilloch, and a quantity of alcohol was seized in the Hillhead area. A 21-year-old woman was also issued with a fixed penalty notice for drinking alcohol in public. Officers also charged a youth with allegedly starting a fire near houses in the Luggie Park area. And a 15-year-old girl in Milngavie was escorted home by police after being found under the influence of alcohol.